Appreciate every detail with the LG 55SK8500PLA 55" Smart 4K Ultra HD HDR LED TV. With IPS 4K Nano Cell technology you get deeper blacks and uniform colour for vivid and realistic images. See the contrast of space and stars in a fascinating stargazing documentary, immerse yourself in a shadowy thriller, or enjoy a football pitch that's as vivid green as the real thing. You get the same experience wherever you sit, even at off-centre angles, so the whole family can gather round and enjoy a Saturday night blockbuster. The a7 Intelligent Processor is the brain behind the SK8500. It delivers enhanced picture processing for clearer and brighter images. So whether you're watching an Attenborough documentary, or the local news, all your content looks great. With more and more entertainment now available in HDR, the SK8500 supports major HDR formats, including Dolby Vision and HLG. You can now enjoy that blockbuster the way the director intended with brilliant contrast and a wide colour palette. Your living room just got smarter with ThinQ AI and Google Assistant voice control. With ThinkQ AI you can change channels, stream shows on Netflix or find out what time the big match kicks off. And with Google Assistant you can connect to other smart devices throughout your home, as well as get news and information like weather updates and events in your calendar. So get the family together and with simple voice commands you can dim the lights, turn the volume up and pick out a great movie all through the LG 55SK8500PLA. Brilliant visuals deserve brilliant sound. Dolby Atmos brings the cinema experience to your living room without the price of admission. Hear that helicopter overhead before you see it, observe the sound of rain falling through the trees, and listen to the crunch of leaves with every step. There'll be no more cries of boredom – LG's webOS delivers a whole range of apps to keep everyone entertained. Binge-watch a Netflix Original in 4K, dig into All 4's back catalogue, or share the latest trending video on YouTube. You can even access content straight from the TV guide with Freeview Play. Simply scroll back up to seven days and catch that soap you missed. Is have the SK95, really nice tv. got this TV few weeks ago from Curry's but not sure with it. my old tv looked better to be honest. anyone recommend any better screens around £700-£800 mark ? Once set up and calibration is correct this is the best 2018 uhd led avaliable, nothing touches it nor for gaming inputs. Tests show it to be top of the top and after owning it I would agree! The 9500 is only just better but barely. Price is a bit high though as I got mine for £600. i went into Curry's today looking for OLED rather than this TV , the salesman was very honest with me and told me not to purchase anything today as the prices on most TV's will fall again on Thursday for another Easter Sale. 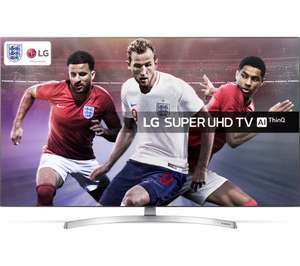 Better off with a TCL 55 inch for £349 price just dropped £200 - half the price of this one! Used to like LG but see too many in the workshop now with dodgy power supplies and cheap blown leds! One 25p blown led and your entire tv goes up the khyber! And if you really want peace of mind best to buy from Richer sounds - 6 year guarantee cant beat it! Most led tvs fail within 4-5 years in my experience - same as the old plasmas! Can I ask why this is going cold? I was thinking of getting this model and even more now that it’s gone down by £80.00. What am I missing? Can I ask why this is going cold? I was thinking of getting this model and …Can I ask why this is going cold? I was thinking of getting this model and even more now that it’s gone down by £80.00. What am I missing?